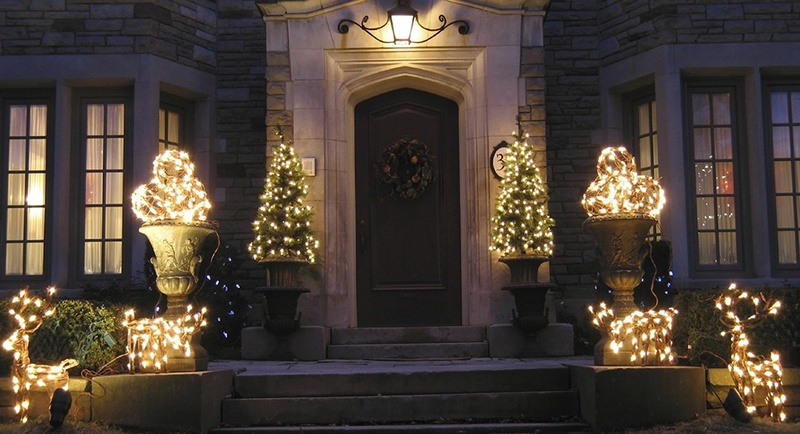 Create a warm welcome for your family and guests as they enter your home this holiday season! Anybody can put a wreath on a door during Christmas, and if that's your style we're here for it! But if you're looking for a bigger, bolder and more eye catching Christmas door display than just a wreath can provide - we're also here for you too! We're here to help every Christmas decorator from the easy going minimalist to the "I need to see my house from space" enthusiast. So if you're looking for Christmas door decorating ideas, you've come to the right place. 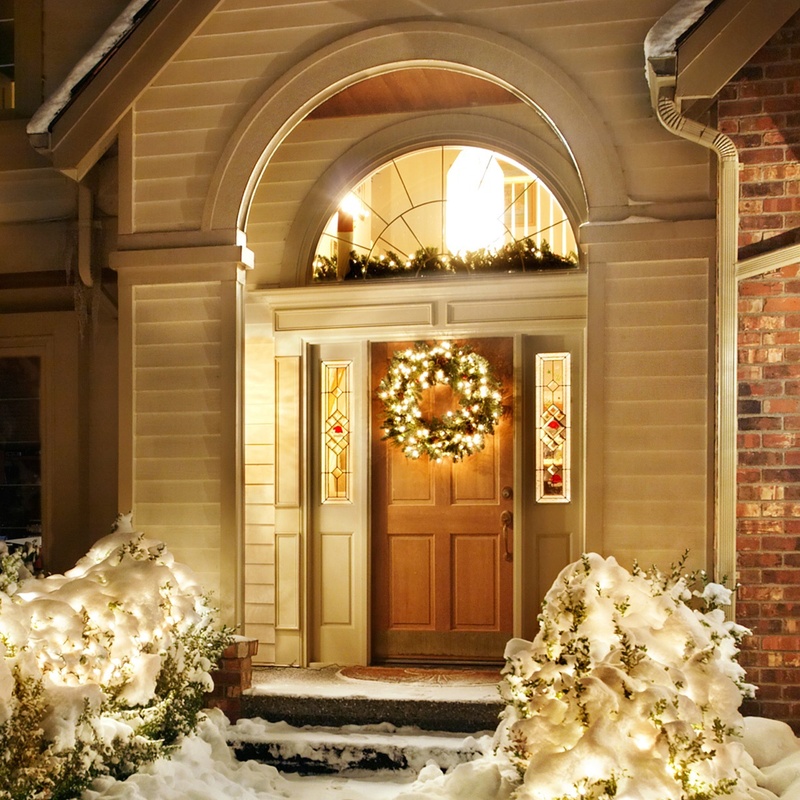 We'll guide you through the options to make sure your front door is filled with cheer this holiday season! Placing a Christmas wreath on the front door of a home is not a new idea. This classic Christmas door decoration has been around for a very long time and we don't foresee its popularity waning anytime soon! A simple green wreath with a bright red bow will look perfectly in place on any type of door, or doors if you have two. 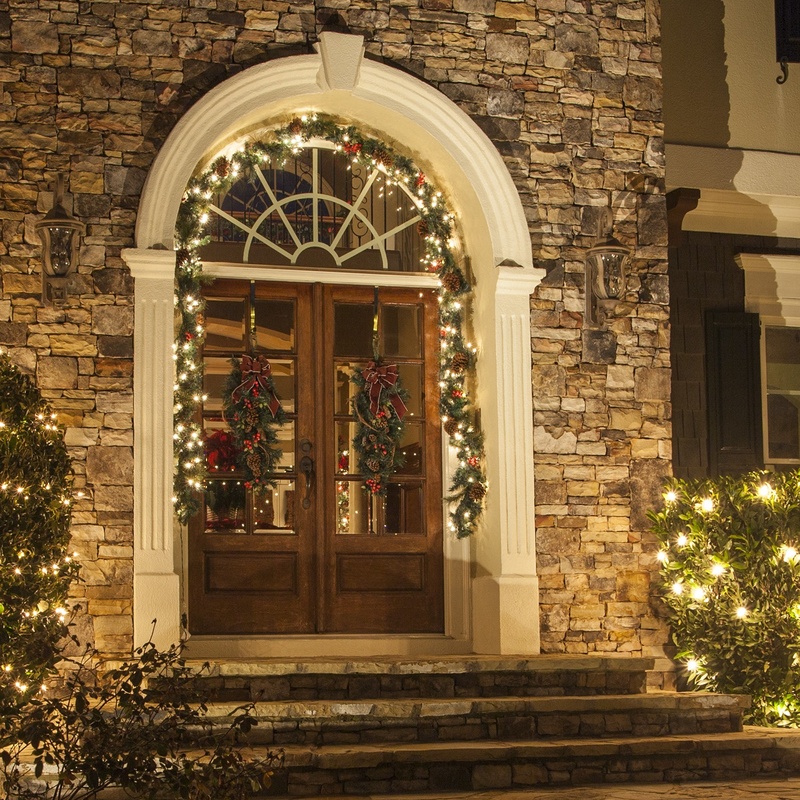 Wrapping a wreath with battery operated lights to match your exterior Christmas lights is a beautiful way to cohesively carry your theme from the roof to the front door. If you're feeling crafty, you could also create your own DIY wreath using your preferred florals, embellishments and lights. You can find a wreath wire frame at almost any local crafting store, from there it's just a matter of attaching whatever decorations you like. We recommend starting with a base of garland or vining material and then building onto your wreath from there. If your front door is not protected from the elements, you'll need to select items that are outdoor rated. If you want to try something other than a wreath, teardrop garlands and decorative door swags are just as beautiful with unique curb appeal. 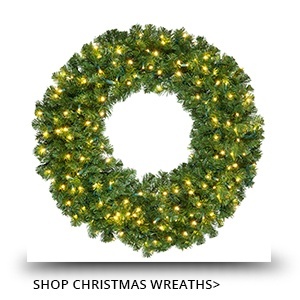 Wreath Decorating Tip: Select a Christmas bow that measures 1/2 the diameter of your wreath. For example, a 30" wreath will look best with a 15" (or close) bow. Wreath Hanging Tip: Hang a wreath on your door using an outdoor rated suction cup, magnet, or door hanger designed specifically for wreaths. Placing a wreath on the front door is the easiest and most classic way to decorate your front entry for the holidays, and for some this level of Christmas decorating feels just right. But if you're an over-the-top Christmas enthusiast, or you just want to bring more joy to the front entry of your home, the area immediately surrounding your door is a treasure trove of untapped decorating potential! 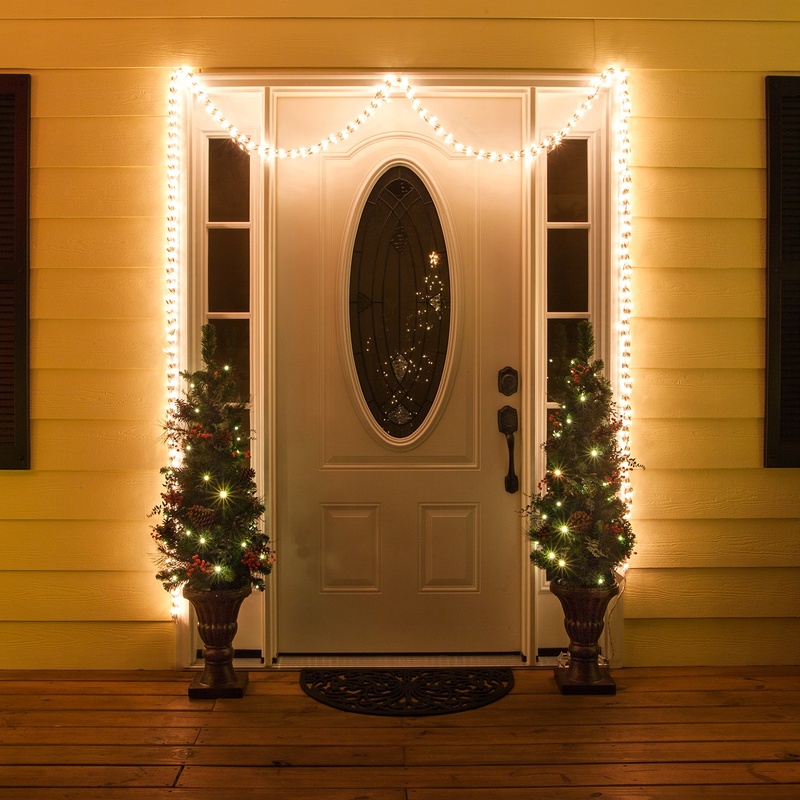 For a simple way to add interest to your front door, the door frame can be accented using strings of Christmas lights or garland lights, which are several light strings intertwined. 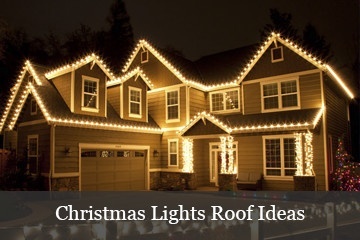 Simply use outdoor rated clips or small nails to help guide the lights around your door frame. 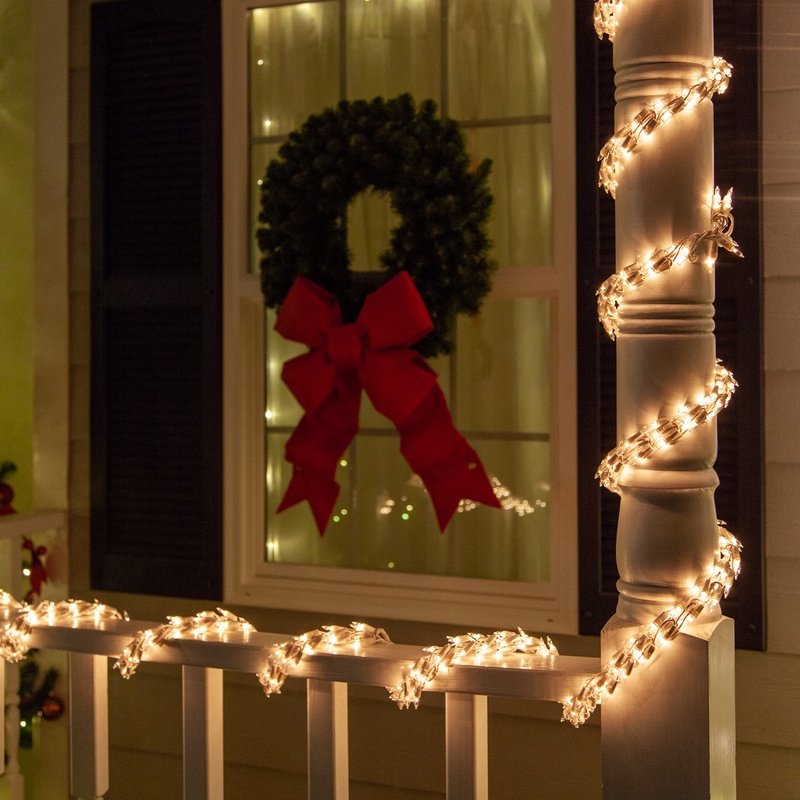 The same string lights and garland lights you use around your door can also be used to wrap columns and railings on your porch or walkway trees leading up to your door. 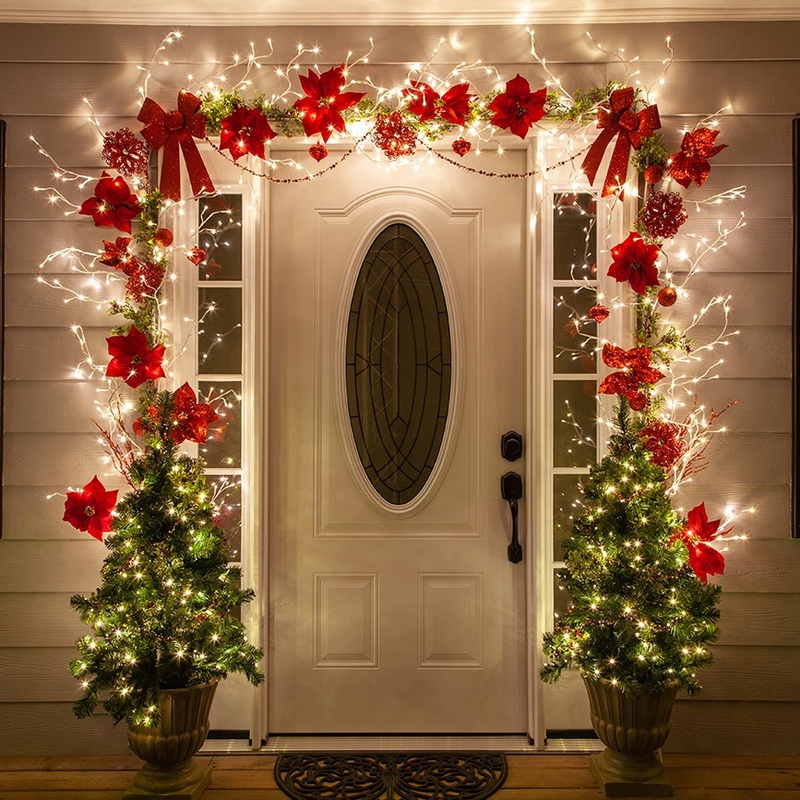 If you'd like to be more adventurous in your door decorating design, you could place a Christmas garland or lighted branch around your door and then attach decorative flowers, ribbons, ornaments and embellishments using a floral wire that matches the color of the branch or garland. 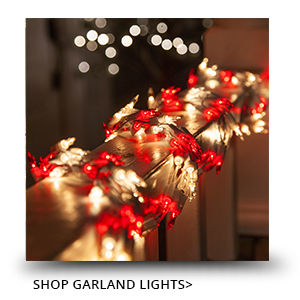 Special garland hangers are available for attaching garland to a door frame, whereas lighted branches require outdoor rated clips or adhesive to stay in place. To create the Christmas door decoration idea pictured below, we attached two white climbing vine lighted branches around our door frame using outdoor rated adhesive clips. You could also use clear tape or a strong removable adhesive for this project. To keep the thick trunk of the vine in place, brad and cable staples can also be used. Regular staples are an option for anchoring the smaller branches coming off of the trunk, however this could cause damage to the light wires or the wood surrounding your door, so we recommend trying one of the options listed above first if at all possible. Once the vine was in place and each branch was positioned the way we wanted, we attached a simple green eucalyptus garland to the center stem and then began layering in poinsettias, ornaments and decorative accents by attaching them to the vine using floral wire and hooks. If your door is not covered, make sure the items you use are rated for outdoor use. Porch Christmas trees are a classic and ever popular door decoration. Wrap existing front door trees and topiaries with Christmas lights, or take advantage of empty pots for the season by staking mini outdoor Christmas trees into soil. 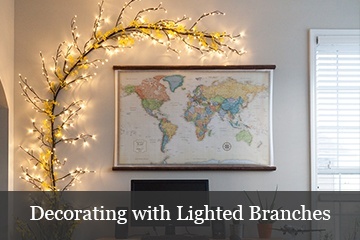 Leave trees undecorated or add berries and pinecones for a more natural outdoor look. Place topiary animals as decorations on each side of the door to create a lively Christmas display. 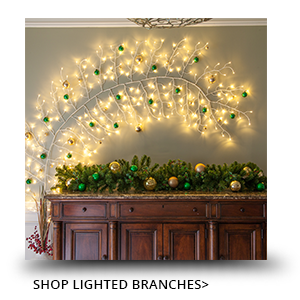 Prelit topiary and grapevine reindeer are available in LED and Incandescent lighting options as well as various poses including prancing, kneeling and gazing. Smaller topiaries work well for the porch while larger variations can be used throughout the yard to create a cohesive outdoor Christmas display. 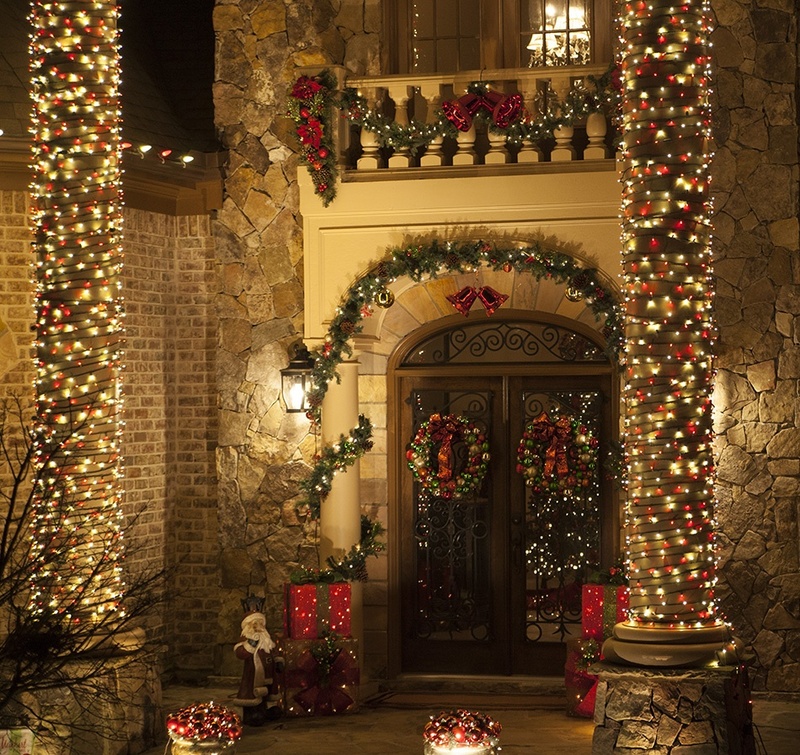 Extend your Christmas door decorations to the porch and down the walkway by wrapping columns and railings with string lights, garland lights or even Christmas garland accented with red bows. For quick light coverage, column wraps are also available. 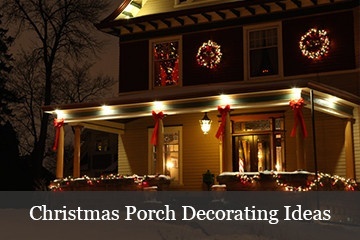 Additional door decorating ideas include filling empty urns or planters around the door with large ornaments, placing lanterns on each side of a stairway leading up to the door, and making DIY lighted Christmas presents for your porch. 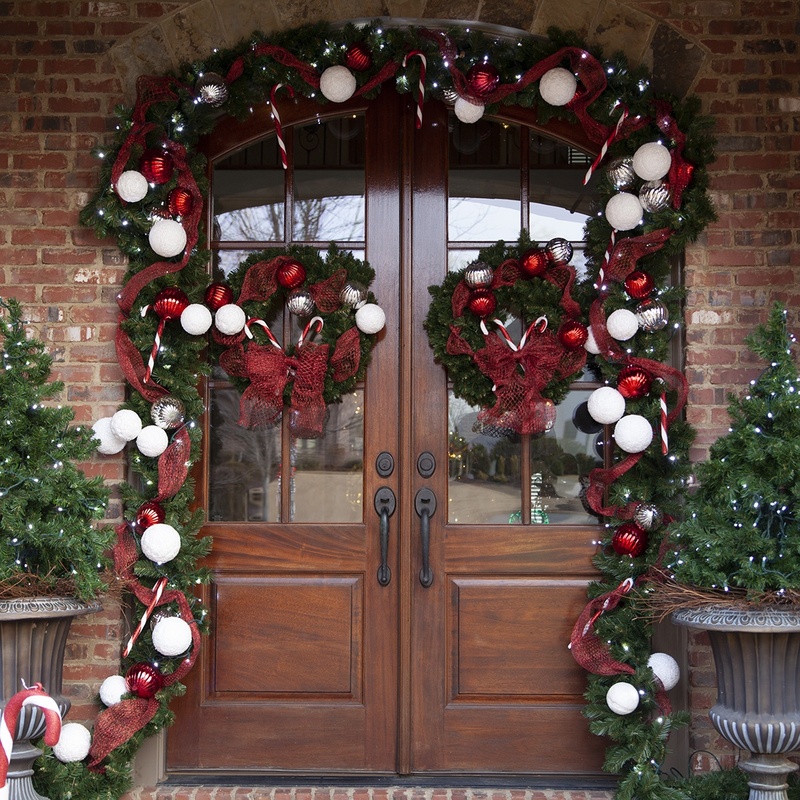 What are some of your favorite Christmas door decorating ideas? Share your photos and ideas with us on social media - we can't wait to see what you create!